The Swedish national team narrowly missed in the 2018 IIHF World Junior Championship, falling 3-1 in the Gold Medal game to Canada in January. The Swedes outshot the Canadians 36-28 but couldn’t turn the shot advantage into a win, though they did take the game to the wire, as Canada scored both the game winner and an empty-net goal with less than two minutes left in the third period. Going into this year’s World Championship, to be held in British Columbia, Sweden has to be considered a favorite for the gold. But that’s expected. 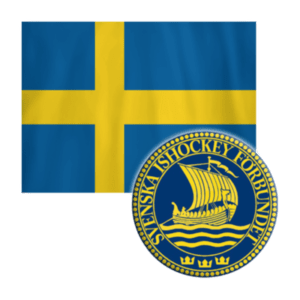 The Swedish national junior team has not finished lower than fourth in the U20 IIHF World Championship tournament since 2006 — when it was fifth. The 2019 rosters haven’t been set yet, but the recent World Junior Showcase in Kamloops, Canada, gives us some idea of which players are expected to be Sweden’s core contributors. “Top offensive defenceman Adam Boqvist, entering his first World Juniors, could see a heavy workload,” Lucas Aykroyd recently wrote in a tournament preview on the IIHF’s 2019 World Junior Championship website. Forwards Jonatan Berggren and Isac Lundestrom “are capable of generating offense,” said Aykroyd, but head coach Tomas Monten might also find in “under-the-radar prospect” Marcus Sylvegard, an “undrafted, hard-hitting 19-year-old,” a key tournament player. “He works hard and I think he had a really good run at home before the World Juniors last year,” Monten told Aykroyd. Undrafted forwards Rickard Hugg (three goals, one assist in five games) and Marcus Sylvegard (one goal, two assists in five games) performed well for team Sweden in the showcase, and could be vital cogs in Sweden’s 2019 tournament team. Forward Lucas Elvenes also had a solid showcase, scoring once and setting up three in five games. Though he had only one goal in four games, Lundestrom was “arguably was Sweden’s best player,” according to Adam Kimelman of NHL.com. Goalies Olle Eriksson Ek and Samuel Ersson were tremendous at the showcase and they could make things hard on opponents if they’re part of the 2019 team. Meanwhile, 17-year-old defensemen Philip Broberg and Tobias Bjornfot might get invitations from Monten to attend camp for the World Championship, says Edmonton Journal hockey writer Jim Matheson. “Broberg is built along the lines of Oilers’ first-rounder Evan Bouchard, having more offensive chops, while Bjornfot is a quieter, Jonas Brodin-type,” according to Matheson. For Sweden, each year is just a reload. The pipeline of junior players is rich. They just keep coming. Japan will compete in Group B of Division I in the International Ice Hockey Federation’s U20 World Junior Championships in Tychy, Poland, this December after being promoted from Division II. It will compete in the same division with Italy, Hungary, Poland, Slovenia, and Japan. Last year’s team earned the promotion with four regulation wins and one overtime win in five games. It was a Division II powerhouse, scoring 23 goals and allowing only seven, and finishing first in the IIA group. The squad was led by 1999-born forward Tohi Kobayashi, who scored four goals and added six assists in those five games. He was tied for second in overall scoring for the tournament, and was a plus-7, a mark no other top-10 scorer was able to reach. Kobayashi was also a force in the tournament the year before, scoring once and setting up four in five games. The Japanese team was particularly strong in goal. Ryota Koda, a 1998, and Eiki Sato, a 2001, were the core of the team. Koda led all goalies with a 0.99 goals-against average and a .938 save percentage in a pair of appearances. Sato played in five games, recording a 1.66 GAA and a .917 save percentage, good for second among all goalies. Sato put down a 1.80 GAA and .937 save percentage in five games in the U18 Division IB play last season. He was named Best Goaltender for 2017-18 in the U18 WJC. Daiki Ayoama won the top defenseman award in the 2018 Division IIA world tournament. The 1999-born blueliner scored four times and had one assist in five games. In five games in previous U18 play he scored once and assisted on four goals. Other junior players from Japan who are worthy of mention include 1998 forwards Hiroya Tokuda (two goals, four assists in the 2018 Division IIA World Junior Championship), and Jin Sawade (one goal, five assists), as well as 1999 defenseman Daika Miura (two goals, three assists). The Division IB tournament starts Dec. 8 and runs through Dec. 14.